For Faro Focus3D laser scanners. Designed to connect the Faro Focus3D laser scanner to topographic tripods, surveying pillars and surveying tribrachs, the Gexcel LAN Adapter is perfect in any application where a Focus3D remote control via lan connection is also required. 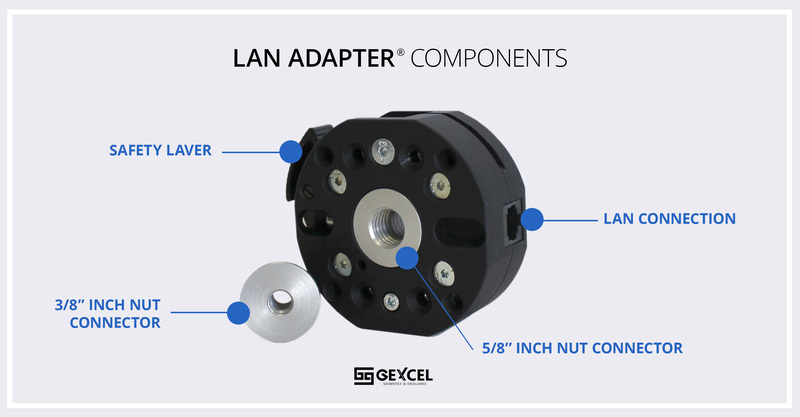 LAN Adapter is furnished with 2 nut connectors to easily, firmly and quickly connect to 5/8'' and 3/8'' inch standard connectors. LAN Adapter is compatible with the following laser scanner Faro Focus3D versions: X330 and X130.